Enriched. Empowered. Educated. Young Leader. 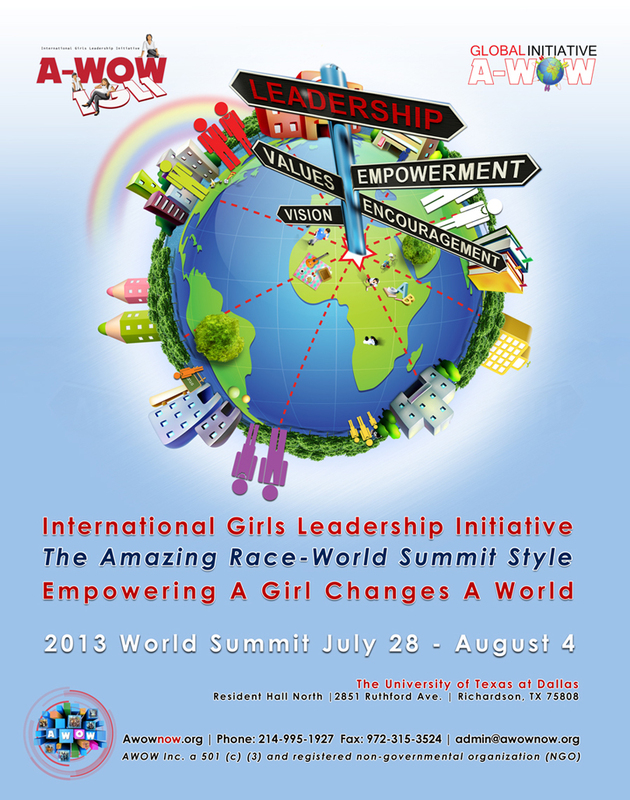 With an impressive lineup of speakers, action labs for learning, community service projects and site visits to local businesses, the AWOW International Girls Leadership Initiative 2013 World Summit will offer you opportunities to become a more focused, energized and successful leader. Make your plans now to join us and ensure that you are enriched, empowered, and a young leader. This World Summit follows one of the core development goals of the United States White House Council on Women and Girls and the UN Women…. achieve ‘Gender equality and women empowerment” for all women and girls’. Participants from other AWOW programs in Ghana, Costa Rica, and Liberia will be in attendance with young ladies from the US. From July 28-August 4 2013 AWOW International Girls Leadership Initiative is hosting this year’s World Summit in Dallas TX over 70 young women from Ghana, Liberia, Nigeria, Costa Rica and the United States will be given opportunities to improve themselves, learn approaches for economic empowerment and explore solutions to support their communities. 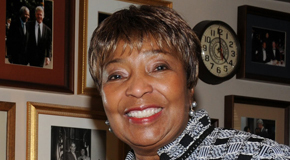 Top leaders from the government, arts and media, social development and the business sector serve as mentors and numerous corporate partners including; American Eagle, Alliance Airport Fort Worth, African American Employee Resource Group, Texas Aero Engine Services Limited, City of Dallas, and Wal-Mart are assisting to make this year’s event a success. Applications are being accepted for participants through July 20, 2013. A limited number of scholarships are also available. 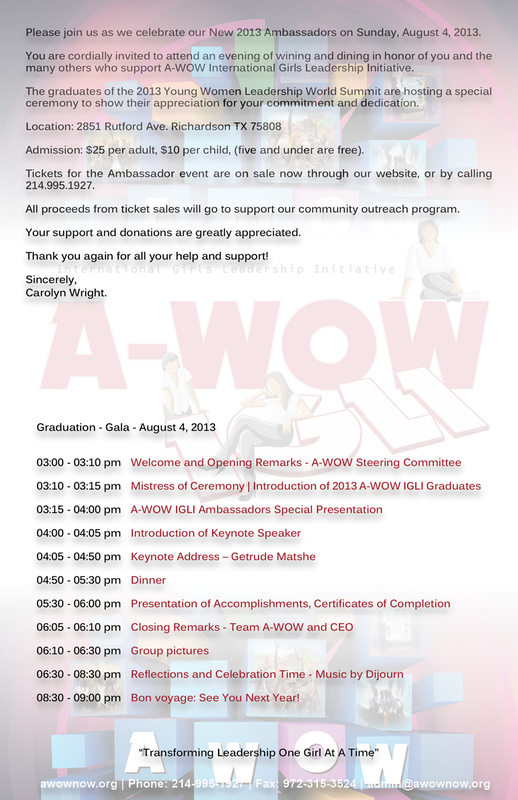 I committed myself to A-WOW because the organization helped more than can ever be expressed with words. This summer as the day became closer to returning to my sophomore year as the Sophomore Class President, I found myself more and more unsure of my confidence in my leadership abilities. Certainly, the last thing I wanted to do was to let my class down. Once I found A-WOW, its ambassadors and volunteers who I met had nothing but encouraging things to say and great advice to give. Moreover throughout this tough year, they have been my support system. I still talk on a regular basis to the girls with whom I graduated. I don’t know what I would have done this summer without this program, and I want to make sure that any girl who feels even remotely close to what I was feeling has the chance to experience this great organization. Three words to describe my experience with A-WOW are safe, opportunity, and wow. A-WOW allows me a safe environment to learn about my leadership talents. It let me strengthen the parts of my leadership abilities I was least confident in. Opportunity presents itself because I meet women who had nothing but my best interest at heart. They gave their advice from what they had learned from experience freely. By meeting these women, you have the opportunity to uses their knowledge and connections to open doors for yourself and they are more than willing to help you. My last word, wow, is at the very heart of the organization’s name. All of the girls in this program bring to mind nothing but awe from me and my gratitude for their acquaintance. A-WOW envisions itself as the preferred girls’ leadership initiative, providing a global brand of high potential, responsible, positive, effective environmental and innovative leaders. In the future, I want to be one of the people that aids in the fulfillment of this vision. I will always feel this organization gave more to me then I will in anyway be able to give back, but I know I will spend the rest of my life trying. Since I join A-WOW IGLI I have met some amazing young ladies which I have adopted as my sister. I have also met a lot of wonderful mentors that gave words of encouragement whenever I needed it. 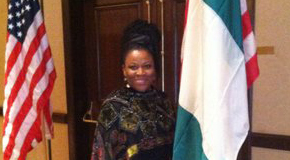 Being in this leadership program I have learned that each of us (ladies) are different and beautiful in our own way! As a beginning participant of AWOW I greatly appreciated the time and all the things I learned. The prestigious people I met and the numerous things they taught me are well worth it. I learned things that school does not teach, sometimes parents' may not teach and if you are not paying attention, life may not teach. I will absolutely do it all over again and not change anything! A-WOW IGLI really made a great difference in my life. I’ve learned so much about how to be an excellent leader and growing to be a mature young lady. I’ve become more of a leader instead of a follower. I am so thankful for all the guest speakers and founders of A-WOW IGLI for the two great beneficial, life changing weeks! I definitely recommend this program to any young lady wanting to become a better leader. that I would recommend this program to others because if it made a difference to me, it will also make a great change in someone or make a huge difference in someone's life. A-Wow is a stepping stone in a young woman's life.It's a single moment where she can pause and ask herself the hardest question any adolescent child will ever come across. Who am I and who do I want to be. It's one thing to know who you are, but sometimes the person you are isn't exactly who you want to be. A-WOW in this sense has taught me many things. Not just about college and the best bank to leave my money. A-WOW has taught me a variety of things but the most precious lesson of all is learning how to look at yourself. Since I've left the conference thats exactly what I've been doing.I've been trying to mold myself into the person I want to be I know I'm not there yet, Im barely seventeen, its going to take patience and wisdom, two things I have neither of. But at least, I'm making progress. Because of A-WOW I'm experiencing my own silent reformation, and with every small change comes either a positive or negative result. The choice is in nobody's hands but mine." "Empowering A Girl Changes A World"
The A-WOW World Summit (AWS), features sessions and unique educational opportunities. The program is designed to help young women, ages 16-24, contribute to; poverty reduction, increased entrepreneurial competencies and the development of leadership skills to positively impact growth of local, national and global economics. Our aim is to empower a generation of young women to think for themselves and embrace the world with love, dignity and respect for all humankind. Young women who attend A-WOW programs show positive and significant change in their interpersonal skills and self -development sense of self confidence. Those associated with these young women often comment on their improved self-worth and changes in the way they deal with problems at home and at school. It is clear our programs help young woman develop competencies for making decisions, and thinking about themselves and their futures. Our goal is to help those who attend this World Summit, become stronger leaders and establish an enduring legacy within their community. We seek to combat illiteracy and equip young women to live effectively in a global society. 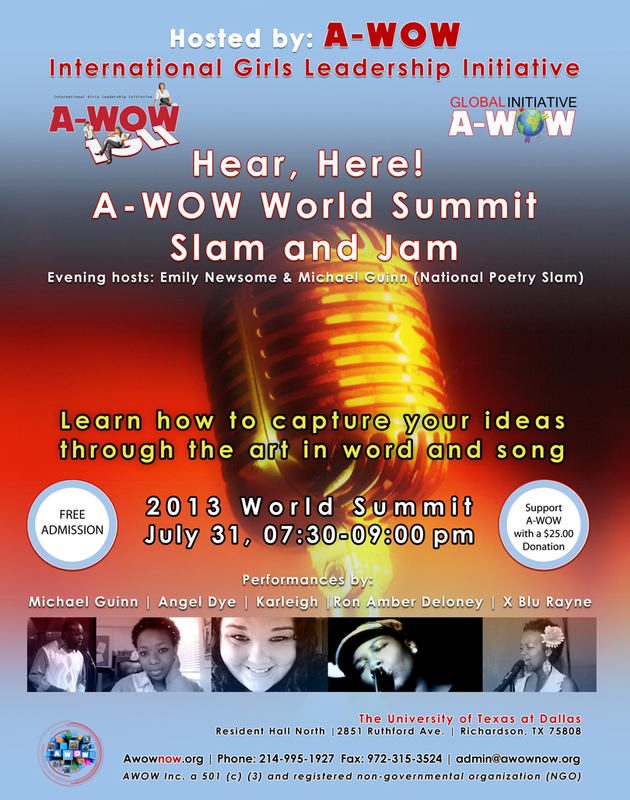 Take this unique opportunity and enhance the learning you'll receive in by attending the A-WOW World Summit. Action Lab 1 - Facing the Future: What Humanitarian Leaders Need to Know? This session provides an opportunity for participants and reflect on their experiences, to share insights with peers, and to discuss and debate the key issues global leaders might face. As our understanding of leadership evolves, so does the environment in which leaders operates. Action Lab 2: Think to Think: What Does It Take To Be An Innovative Thinker? Most people think about what they actually see, or what they have seen before when deciding what is possible or even when creating a new idea. ‘Thinking to Think’ is about imagining the unthinkable and considering what could be possible. This type of thinking involves being innovative. It is the way leaders create value and implement new ideas. When a leader champions an innovative idea she decides who needs to be responsible and negotiates for what resources are needed to move the idea forward. Thinking to think means you are willing to become an ambassador for future ideas. Action Lab 3: Asset Based Community Development (ABC): What Is ABC? Asset-Based Community Development (ABCD) works from the principle that every person has capacities, abilities and gifts and that the quality of an individual life depends in part on the extent to which these capacities are used, abilities expressed and gifts given. Recognizing the assets of individuals and communities is more likely to inspire positive action for change from within than an exclusive focus on needs and problems. ABCD focuses on what is present in a community rather than what is absent and requires us to look afresh at marginalized communities and see opportunities rather than problems. “Relationships are really what we’re all about. That’s what our lifetime is about – our relationships with ourselves, with each other, with our environment, with the world we live in… Because at the end of our life, relationships are really all we have. Participants will gain knowledge about relationship issues affecting their lives, including peer and family relationships, dating relationships, and school climate. This session will focus on healthy relationship skills and recognizing unhealthy relationships including dating violence, bullying, and cyberbullying. This interactive session addresses the question, “What are some ways to identify and deal with unhealthy relationships? As companies shift business models and search for new sources of revenue, many business leaders are adjusting their strategies to meeting the shifting demands of finding valuable talent that will produce superior results. Current and future employee skills are refreshing corporate strategies and focusing more on talent stewardship and targeted development. This session addresses the question, “How to acquire valuable employee skills and gain experience to build your skill set and securing employment. Action Lab 6: The Next Steps: Where Do We Go From Here? 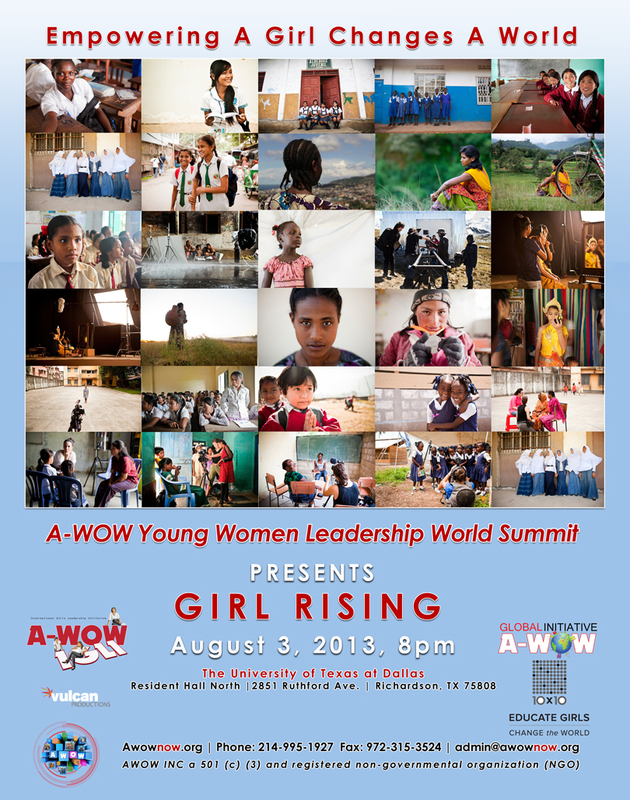 The next phase for A-WOW International Girls Leadership Initiative. In this session we will discuss things we need to consider to ensure our organization’s success and sustainability. A-WOW will select 50 emerging young women ages 16 – 24 from around the globe who are committed to being a servant leader, in good academic standing, exhibit strong leadership skills and interested in social, economic, political and global issues impacting women and girls. Installment must be paid no later than 5:00 pm on the due date. Registration fees will be refunded only if written notice of cancellation is received by A-WOW on or before June 8, 2013. In the event of a written cancellation, 30% of the registration fee will be retained to cover administrative costs. After June 8, 2013, NO refunds will be given. 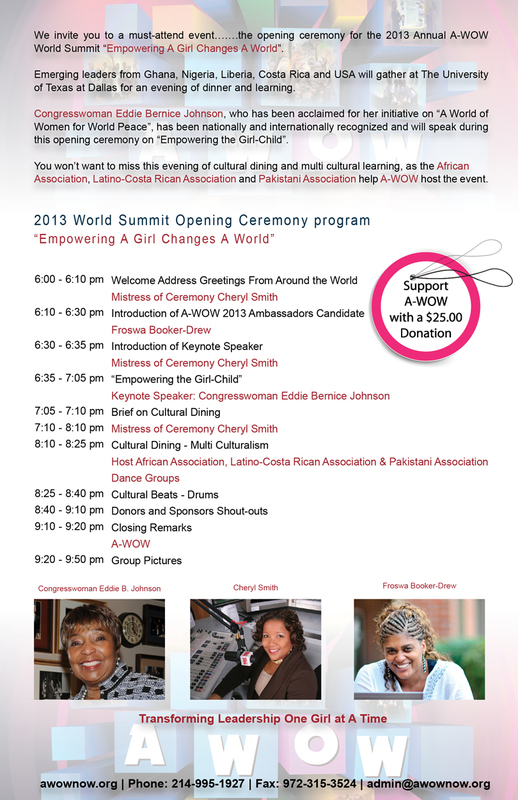 The A-WOW Young Women World Summit is not for everyone. We seek to find the right candidates that are willing and committed excellence, leadership and being an agent of change. Participants must be prepared to participate in the program—committing the time and energy to take full advantage of the program. The Summit centers on time commitments and individual participation. Commitments involve community service, completion of daily assignments, team-work, networking, attendance and daily participation. 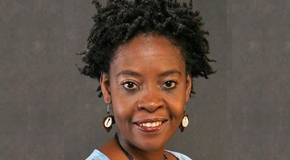 A-WOW INC. a 501 c 3 and NGO serving Costa Rica, Ghana, Liberia, Nigeria and United States that actively promotes multiculturalism, leadership, education and innovation. 2013 © A-WOW | All Rights Reserved.